Employers are using credit checks against otherwise qualified workers. Here's what we can do about it. Over the last decade, an increasing number of cities and states passed laws limiting the use of credit checks in hiring, promotion, and firing. 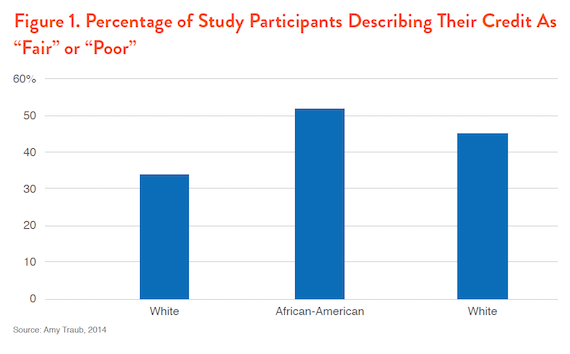 These laws have been motivated by the reality that personal credit history is not relevant to employment and that employment credit checks prevent otherwise qualified workers with flawed credit from finding jobs, and that unemployed workers and historically disadvantaged groups, including people of color, are disproportionately harmed by credit checks. Our new report, "Bad Credit Shouldn’t Block Employment" shows that credit check laws work, but also finds that there’s far more to be done. Further, New York City’s recent, comprehensive law offers the best legislation on the books for other states to follow – and improve on. New research by economists Robert Clifford and Daniel Shoag suggests that credit check laws are effective at increasing employment among those with low credit scores. 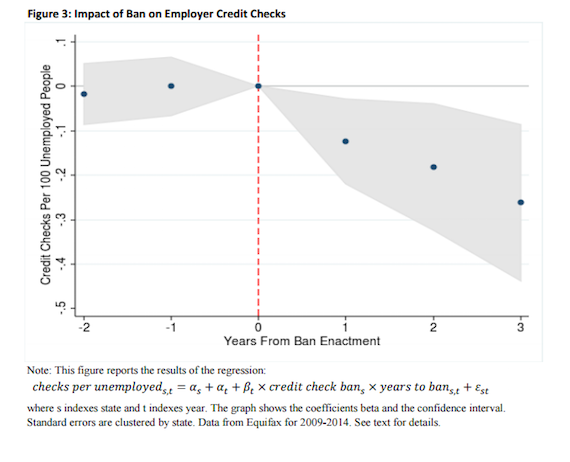 The authors find that credit check laws lead to a 7 to 11% reduction in uses of employment credit checks, a significant reduction, though it’s clear that many employers still use credit checks even with the laws in place (see chart). Demos’ research suggests three reasons why the use of credit checks persist. First, because state bans include many exemptions allowing employers to continue checking credit as part of the hiring process, even when these exemptions are not justified by any empirical research showing that credit is relevant. Second, because laws are insufficiently publicized, so employers and employees may not realize that employment credit checks are prohibited. Third, a lack of resources has rendered enforcement of workplace protections very weak. Despite these shortcomings, Clifford and Shoag find that laws banning credit checks succeed in increasing employment in low-credit census tracts by between 2.3% and 3.3%. They also find that the largest impacts were found in the public sector, likely because this is where compliance with the law was highest. The authors find that companies shifted away from credit information to using other indicators such as college degrees and prior work experience. Given that these factors actually contain meaningful information about job performance (while credit checks do not) this is preferable to the previous status quo. Credit check laws are not a panacea for discriminatory practices, and other regulation may be needed. In many cases, states were doing very little to enforce the laws, normally because they are required by law to respond to complaints, and receive very few, if any. In Connecticut, after four years there had only been two complaints, and neither were found to have merit. The two complaints Maryland had were both resolved informally (without citations or fines). Oregon provided Demos with data from all cases filed since their law’s passage, which included eight cases, one of which had been settled privately, another withdrawn to court and a final leading to negotiated conciliation. Elizabeth Funk of Colorado’s Department of Labor tells Demos that they had received between 10 and 20 complaints, about half of which had lead to investigations. As of yet, there were no fine levied, but they reported being in the middle of investigations. This is not to fault the government agencies tasked with enforcement - given the wide range of activities they oversee, credit checks are likely to be de-prioritized because there simply aren’t many complaints. Given the deep austerity afflicting state governments, resources are scarce. In addition, credit check laws don’t give the agencies the power to initiate investigations, which means that public awareness is key. But beyond brief press coverage at the passage of the laws and some information on state government websites, there has been very little effort to publicize the laws. In 2015, New York City enacted the most robust employment credit check law on the books. The law was enacted with a diverse coalition including labor, community organizations, civil rights groups, students and consumer groups. While the law still contains exemptions, these are narrower than in many laws in other states. The exemptions were the result of local political compromises and should not be considered a model for future legislation. The law also includes strong penalties - up to $250,000.. In addition, New York City undertook an extensive public awareness campaign, including ads on subways and buses, as well as a social media campaign including the hashtag #CreditCheckLawNYC. The NYC Commission on Human Rights created a webpage clearly explaining the implications of the law. Credit checks are a racially discriminatory and unnecessary qualification for employment. States should implement laws to restrict the practice without unjustified exemptions. New laws should include robust enforcement mechanisms and should be broadly publicized so that workers, job-seekers and employers alike are aware of these important protections. Read the full report: "Bad Credit Shouldn’t Block Employment: How to Make State Bans on Employment Credit Checks More Effective." Amy Traub is a Senior Policy Analyst at Demos.